It is an advantage for big manufacturers and transporters. Three months ago, when the central government was getting ready to roll out the Goods and Services Tax, the textile industrial cluster of Surat, Gujarat, India’s biggest manufacturer of synthetic fabrics, was distinctly nervous. At play were two conflicting views of how the new tax regime would affect India’s predominantly informal business sector. The government said GST would make it impossible for firms to evade tax. Even small companies would enter the tax net, boosting both the formalisation of India’s economy and tax revenue. Companies in the Surat cluster, however, were unsure if they could pay these taxes and remain competitive. Such fears, dismissed by GST supporters as no more than a desire to avoid paying taxes, resulted in the industry petitioning the government several times. When that failed to deliver relief, they went on a general strike in mid-June. The government still did not yield. There was a police crackdown, and the strike petered out. GST was rolled out as planned on July 1. Two months on, where do things stand? What do these early days of the new tax system tell us about which scenario is playing out? Are businesses formalising? Or are they heading into trouble? As Scroll.in’s previous dispatch from Surat pointed out, two value chains co-exist in the cluster. The first is disaggregated, comprising thousands of small units that focus on only one part of the garment-manufacturing process. Some units make yarn, others weave it into fabric. Many of them print, stitch and embroider the garment, or stick on diamonds and more as it moves towards completion. Surat’s 65,000 or so textile traders play a large role in this architecture. They take orders from textile and garment sellers and lead the consignment from unit to unit along the manufacturing process. It is a buzzing, competitive value chain where thousands of small businessmen, running their units with the labour of migrant workers, compete with each other for business. The other value chain is vertically integrated: large companies that manage the entire production process in-house – from weaving to design to post-production. There are no more than 10 such firms in Surat. Most units in the cluster operate in the disaggregated value chain. In just two months, GST has radically reconfigured both these value chains. Take the disaggregated value chain. One way to understand how it is doing is to visit Surat’s impeccably organised textile markets. These are large shopping complexes – some with as many as 5,000 shops, each housing a textile trader. In May and June, this reporter saw the traders sitting at desks or on mattresses covered with white cloth, telephones near them. Stacked up in their shops were bales of merchandise. Outside in the corridors, workers from Uttar Pradesh, Jharkhand and elsewhere busily packed finished garments for dispatch. Things were quieter in early September. The corridors were much less crowded. Even on the street outside, no more than six or so tempos were parked, waiting to be loaded. “There is no business,” said Neeraj Mittal, a trader in his 30s who runs Srutika Sarees. “Orders have dried up.” Srutika’s buyers are based in Maharashtra, he said. They would travel to Surat, buy in cash, and take the garments to sell in their local markets. Those buyers have stopped coming. Either way, the traders’ volumes have fallen. The implications of this drop stretch beyond the textile markets to the small units that produce the consignments for the traders. In south Surat is Pandesara, one of the older industrial estates in the region. As the highway approaches the estate, factories appear on the right, and on the left, orderly rows of weathered four-storied buildings. Walk between the rows and all you hear is the clacketing of powerlooms. This is where Pavan Daga works. A slender man in his 50s, he runs a small garment manufacturing business called RDI Tex Fashion. RDI is an assembler. Once other firms take care of specialised aspects of the production process, such as embroidery, it puts the final garment together. Units such as this are modest businesses – RDI has an annual turnover of about Rs 15 lakh – which survive on the deceptively fat margins they retain of 30% to 40%. A 40% margin translates to Rs 6 lakh in annual income, or Rs 50,000 a month. But take out what Daga pays his workers and he is left with half that amount for his household. Between this and falling orders from traders, his gross margin is slipping towards 10%. “All this is happening when we have not even recovered from notebandi,” he said. “Ek taraf notebandi aur ek taraf yeh.” We are trapped between demonetisation and GST. Mittal agreed, saying larger companies are adding new customers because they can afford to move their stock to other states as well. But talk to the large firms and they are not quite happy either. 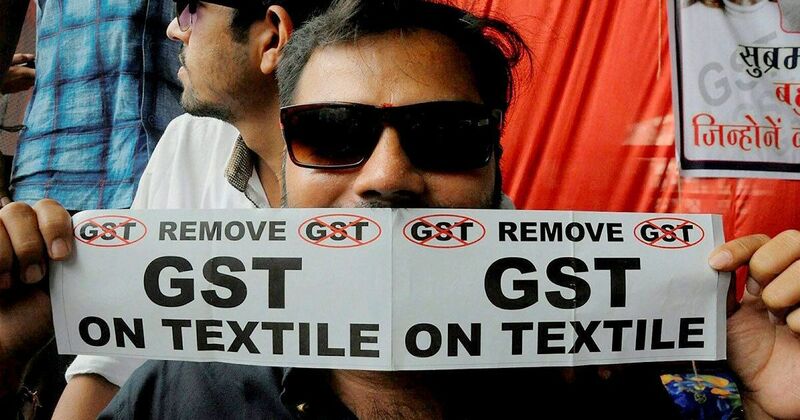 The managing director of the sari-manufacturing business in Surat flagged an anomaly in GST rates to illustrate why his company’s competitiveness is suffering. In the GST regime, tax is not levied at the end of the production process but at every step along the chain. And every company in the value chain has to only pay tax on the value it adds. So, if a company buys polyester yarn for Rs 1,000 and sells the finished garment for Rs 1,800, it only has to pay tax on the Rs 800 of added value. In case the company pays more than what it needs to, it can recover the balance from the government when the buyer of the garment pays tax. As this explainer points out, the surplus can be claimed as a refund, or used against future tax payments. But that is not how it works in practice. Take the company buying polyester yarn at Rs 1,000 and selling the finished garment at Rs 1,800. It has to pay 5% GST on Rs 800, the value it added by turning the yarn into garment, which works out to Rs 40. This street outside the textile market used to be crowded before GST was rolled out. Put it all together and you see just how disruptive GST is for Surat. Not only is it changing the cost structure of the cluster’s value chains, it is also changing consumer behaviour and the profile of competitors. As the managing director said, “In all this, transporters ko bahut maja aa gaya.” Transporters are having a ball. “They are earning 2-4 times the usual margin,” he added. How is the cluster responding? Will there be more strikes? No, he replied. There is no possibility of a strike now. People go on strike when they feel the government will listen, he argued, but the government is not willing to listen. “Ab log apne tareeke se kacha pakka raasta nikal rahein hain,” he said. People are trying to find their own solutions. At the same time, as volumes fall and competition increases, the financial capacity of small firms to comply with GST only erodes further. He complained: “Sarkar ne chor banne ke liye logon ko vapas majboor kiya hain.” The government has forced people to become crooks. That is the case with small units. From medium-sized firms, Gandhi, the accountant, sees another response. The promoter of a mid-sized company, which was slipping into losses, liquidated the business and put the assets into mutual funds and real estate. This is something the traders are seeing, too. Since July, said Anil Kumar Singhal, who runs a trading firm called Mukesh Fashion, “At least 150 known traders, whose presence makes a difference in the market, have closed their shops and gone away.” The managing director added: “Every day, the papers carry stories that 2-4 parties have failed. In other words, woh logon ka paisa le kar bhag gaye.” They left town without settling their dues. Where have they gone? They are leaving the trade, said the managing director. “They cannot survive in this business any more,” he added. “So, they are looking elsewhere to make money. Some are giving their premises on rent. They are looking at shares. I see people moving into mutual funds, shares, IPOs, anywhere but business. Hindustan ki entreprenuership par chot lag rahi hain.” Indian entrepreneurship is getting hurt. Earlier this month, Finance Minister Arun Jaitley described the problems being faced by companies and states because of GST as “transient challenges and technical glitches”. He is right, but only in the limited context of the information technology systems of the GST Network – those got overloaded for a while. 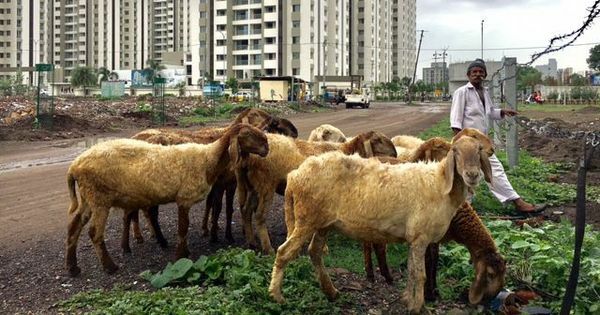 This has implications beyond Gujarat, not least because most of the migrant workers in Surat come from as far away as Uttar Pradesh, Bihar, Jharkhand and West Bengal. “When all these people, the ones working for Rs 10,000 a month in lace or stitching shops, do not know how to support their families any longer, what will they do for survival?” asked the managing director. The other big trend is informalisation. This is taking place see in other sectors as well, such as foodgrains and pulses. Informalisation comes with its own costs. “Not paying GST also means units will be restricted to the cash economy,” said Daga. “They cannot access bank finance. They will have to sell only to customers who want to pay in cash.” All of which puts a cap on their growth, and their ability to soak up manpower. In all this, as production from the disaggregated value chain slows and the large companies are yet to grow to a scale where they can take care of the shortfall, the big unknown is imports. As an earlier article in this series reported, Chinese synthetic fabric imports to India are rising. So far, though, the Chinese have not entered the largest markets – like for saris – that support Surat’s textile cluster. This is something old-timers in the industry are sanguine about: “China cannot make what sells in India.” It is hard to share their optimism. Entering a new market segment is not as hard as they seem to think. Especially with GST hiking the operating costs of large companies, and making it harder for smaller units to produce as much as before. As the managing director said, “Imports ka darwaza bhi khulega.” The door to imports will open now. 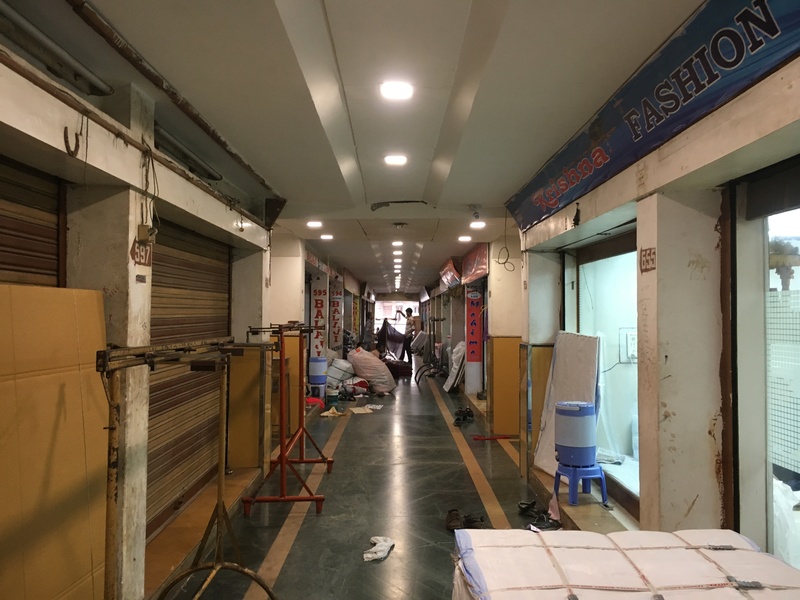 Textile market and the empty corridor outside it in Surat. Read the previous story in this series here. The other articles in the Ear to the Ground series can be read here.